Remember the days when you learned about the quality of a restaurant either by going there or having a friend tell you about it? Those days of “word of mouth” restaurant reviews are long past. 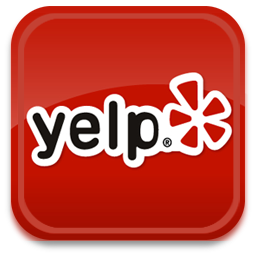 Sites like Yelp make it possible for you to read reviews of restaurants from complete strangers. Some people rant and rave about how terrible their service was, others try to assume the air of a seasoned food critic, while still other folks talk about what they enjoyed. Yelp has forever changed how restaurants do business. Yelp has also made it possible for unethical people to attempt blackmailing restaurants into getting free meals. 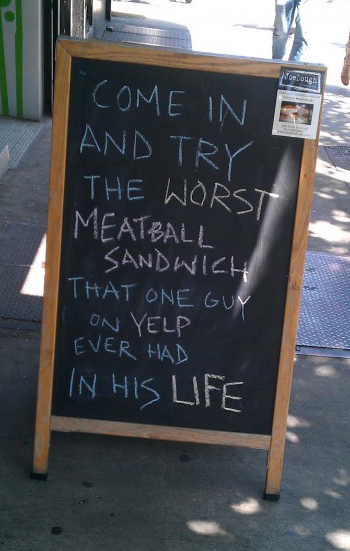 Other restaurants take on the bad Yelp reviewers like the one below. The internet age has transferred the role of food critic from the guy with the newspaper, to anyone with a camera. We all have those Facebook friends that post pictures of what they eat all the time. I’d be willing to bet that 99.5% of their friends that are not their mothers do not give a rip about their food choices, but they continue to post. Our world of celebrity chefs and Food Network has spawned an entire culture of “foodies.” As a coffee snob, I have to be careful about generalizations of people like foodies. I appreciate their passion, but just as I am critical of coffee snobs that talk endlessly of coffee “notes,” I think foodies that evaluate PF Changs as if it were a 5-star restaurant need to take a chill pill. Just saying. Five Guys Burgers and Fries is legit, but their marketing department could never have come up with something as wonderfully brand-building as this review, viewed over 2.1 million times (And autotuned brilliantly). I really want to go to Five Guys now. Happy dining to you all, and keep your food reviews classy. « What songs would I play for Mozart and Beethoven?